Spiced Potatoes with Cauliflower. 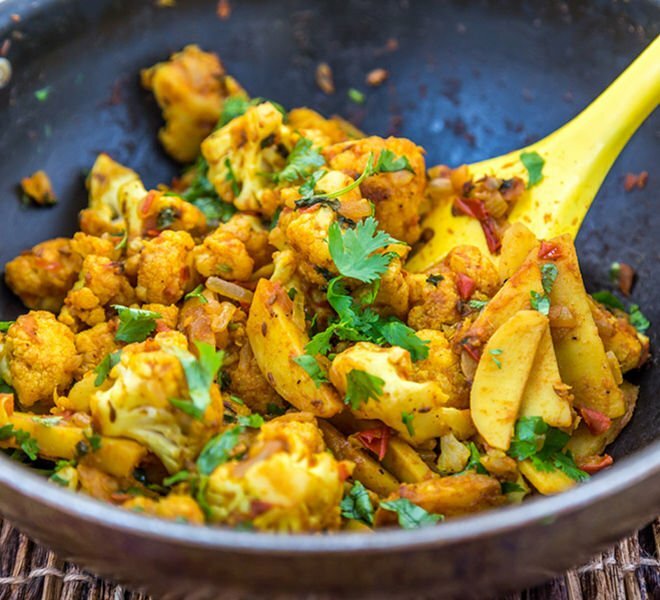 This Aloo Gobi is packed with flavors, super comforting, vegan and simply the best aloo gobi you will ever have! Aloo gobi (potatoes & cauliflower) is a popular Indian dish in which potatoes and cauliflower are cooked with onions, tomatoes and spices. This dish can be made in several ways, you can make it with only onions or only tomatoes or use no onion-tomato at all. 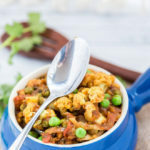 I also make it in different ways depending on what ingredients I have on hand, the aloo gobi recipe that I am sharing today is one of my favorite versions. It has onions, tomatoes, ginger, garlic and yes spices! 1. Half cook the cauliflower and potatoes before adding it to the onion-tomato masala. You can parboil the potatoes and cauliflower or do what I did – fry them in little oil till they are half cooked. This helps in retaining the shape and texture. 2. Don’t cover and cook the cauliflower, you can cover towards the end and cook on low flame only. 3. Add salt towards the end when the dish is almost done. I have made mistakes in the past where my cauliflower was all soggy and I didn’t like it at all and that’s how I learnt my lessons. If you follow the above tips, the texture should be perfect. 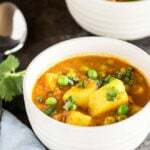 This recipe is vegan just like so many other Indian recipes. I had never heard the term “vegan” till about 2 years ago and now when I think about it, I literally grew up eating vegan all the time. India has countless vegetarian recipes that I grew up eating. We eat simple lentils, rice and veggies everyday and almost all of it is vegan. 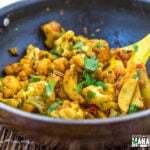 So enjoy this spicy potatoes and cauliflower vegan recipe from India and I hope you like it. Heat 2 teaspoon of oil in a pan on medium heat. Add cauliflower florets and fry for 2-3 minutes and then add the sliced potatoes. Fry on medium-low flame for 7-8 minutes till potatoes and cauliflower have some brown spots on them. Drain on a tissue paper and set aside. In the same pan heat 1.5 teaspoon of oil on medium heat and add cumin seeds and let them crackle. Add the onions and cook for 2 minutes or till onion is translucent. Cook for another 2 minutes or till the raw smell of ginger and garlic goes away. Cook for 2 minutes till tomatoes are little soft. Once the tomatoes are little soft, add turmeric powder, red chilli powder, coriander powder and amchur (mango powder). Cover the pan and let the masala cook for 2-3 minutes. Now add the potatoes and cauliflower to it and mix. Add chopped coriander leaves and give a good mix. Add some garam masala and cook the potato and cauliflower on medium-low heat for 5-6 minutes. Add salt and cover the pan and cook for additional 6-7 minutes on low flame or till the potato and cauliflower are tender but not soggy. If you feel the masala is sticking, you may add some water. Add 1 tablespoon at a time and only add enough to cook the veggies. I did not add any water in mine. Garnish with some more coriander leaves. 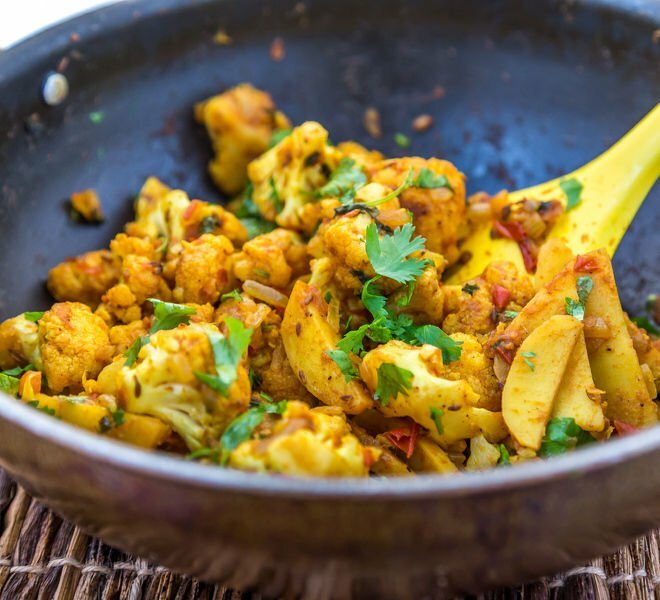 Serve aloo gobi with naan, paratha or roti. * Add lots of coriander leaves to your aloo gobi, it adds a lot to the flavor. * You can even deep fry the potatoes and cauliflower till they are completely cooked and then add them to the masala. But deep frying = more calories so it’s not the way I make aloo-gobhi at home regularly. * You can cook the dish with ghee (clarified butter) or even butter. 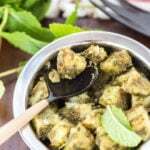 * You can also sprinkle some kasuri methi (dried fenugreek leaves) on top for added flavor. Add the onions and cook for 2 minutes till translucent. Add the ginger-garlic paste and cook for another 2 minutes or till the raw smell goes away. Add the chopped tomatoes and cook for 2 minutes till they are little soft. Add turmeric powder, red chilli powder, coriander powder and amchur (mango powder). Cover the pan and let the masala cook for 2-3 minutes and then add the potatoes and cauliflower to it and mix. Add garam masala and cook the potato and cauliflower on medium-low heat for 5-6 minutes. Add salt and cover the pan and cook more additional 6-7 minutes on low flame or till the potato and cauliflower are tender but not soggy. If you feel the masala is sticking, you may add some water. Add 1 tablespoon at a time and only add enough to cook the veggies. I did not add any water in mine. Garnish with some more coriander leaves and serve hot with any Indian bread. 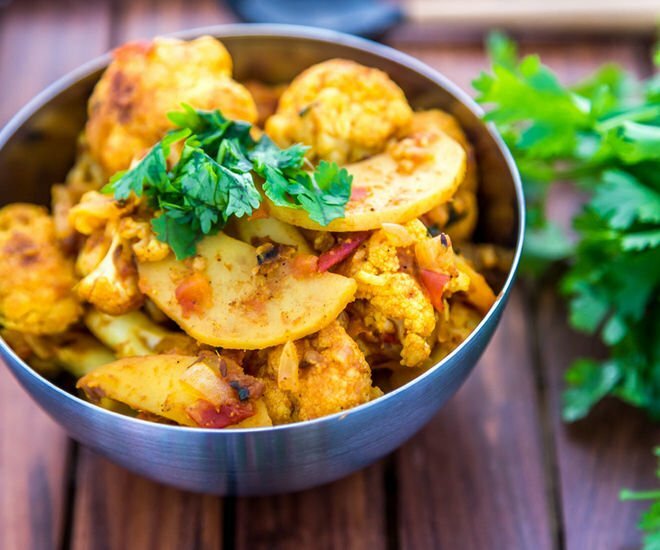 I love the combination of cauliflower and potatoes in this dish Manali! The colour is also so beautiful. Thanks Arpita! it’s my husband’s favorite and so I make it quite often and try to make it different every time! I loved this dish! Easy to follow and i’m glad i followed the steps! I didn’t have mango powder and my husband can’t handle to much spice, so i didn’t add the chili, upped the tumeric and garam masala and added more tomatoes. perfect! Glad you liked it Jocelyn! Made it for the 1St time as a side dish with khuri kitchri, and I also added a few slit green chillies…. Smells amazing! Awesome Sofhia! Glad you liked it! Absolutely amazing, thank you for the recipe! I had to add two cups of water as my potatoes wouldn’t cook otherwise but still… so flavourfull, I’ll be definitely making it again. You are welcome,glad you liked it! Manali – this is one of my favorite dishes I always order out, but now I can make it at home! Going to gather all the ingredients at the grocery store – thank you! Glad you liked it Jenny! This is amazing. Will try this recipe.Any difference without adding mango powder?..I don’t have it. It will be okay without the mango powder too Nasreen, you can add little lemon juice in place. Hope you like it. I made it. It was amazing, thank you Manali for this wonderful dish. Aloo Gobi……..recipe was the best of others I tried!!!! My whole family loved this one! Delicious recipe! Made it two times now. I roasted the cauliflower & potato in the oven with some cumin, garlic salt & pepper for about 20 min before sautéing in the pan. Turned out amazing! Thank you for the recipe! love the idea of roasting the potatoes & cauliflower in the oven first! glad you enjoyed the recipe! How do you roast cauliflower and potatoes ? Do you brush or add oil in the pan and what temperature and for how long ? I want to try this recipe as well. I love Aloo Gobi but my only problem is that my Gobi always become soggy. I love the nice and crispy one you get from the restaurants and hence I am going try roasting it so that I don’t have to cook it for long. Hmm Babitha, if you read the instructions, everything is mentioned in detail. Please go through it and let me know if you have any issues. Gobi won’t be soggy if you follow all the steps in this recipe! This was delicious! Fantastic tip about pre-cooking the cauliflower and potato! Thank you. Glad you enjoyed it! 🙂 This is my favorite too! Found this recipe because I was trying to use up potatoes and a cauliflower. I love Indian food, so it was an easy sell. I am so glad I decided to go out and get the amchur (found at Walmart) because it gave an authentic flavor that I know made the dish even better. Yay for getting amchur! Yes it does make a difference! 🙂 Glad you liked the recipe Melissa! Loved this recipe. I made it with half a lemon juiced instead of mango powder and no tomatoes. Delicious! I’m going to make it all the time. The precook really helped it not get mushy. by the time I got to fry the onions had to add more oil. I used ghee with a little MCT oil and put oil for part of the frying. Didn’t have a tomato so used tomato paste. No mango powder but will buy before i make next time…really good dish and attractive too! Loved the recipe…and your explanations. Thanks! Welcome! Glad you enjoyed it! How much fesh garlic or fresh ginger could you use instead of paste? Good to know 🙂 It’s my favorite too! I just made this for lunch today and it was delicious, better than the restaurant. I didn’t have to add any extra water but the potatoes did take an extra ten – fifteen minutes to cook. Will be making again for sure! Thank you. I made this dish yesterday for a family day Indian themed pot lock…it was amazing!!! Will be making this again. made this today and it was delicious, I will be making it again, frequently I think lol. I would recommend this recipe, it was was easy to make we had most of the ingredients already. Hi Manli I tried. Your recipe. It was very good. I have to make a lot of quantity for a Puja. I can easily mix it and put it in the oven. The last few steps instead of cooking on the range. I am going to deep fry first. Any suggestions please. 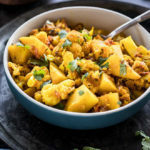 Hi Sunita..if you are making this for a large crowd, you can even oven roast the veggies..425 F for 15-20 minutes..just spray the potatoes and cauliflower with oil, sprinkle some salt and roast..meanwhile get the masala ready and once the veggies are done simply mix them with the masala. OR you can prepare the masala, deep dry the aloo and gobi until they are little cooked (but not entirely cooked) and then add everything in a pan and cover with aluminium foil and bake at 350 F for 15-20 minutes until done.